Mount Everest’s soaring summit has always attracted adventure lovers and adrenaline junkies from all over the world, and this Everest Base Camp tour also makes it possible for the regular traveler to explore this natural wonder with a highly experienced and licensed trekking guide. The Everest Base Camp trek is one of the most popular treks in Nepal and for good reason. A breath-taking flight to Lukla airport, stunning Himalayan scenery, the world’s biggest glacier, thrilling trekking passes and warm hospitable Sherpa culture, together with hundreds of year old monasteries are some of the main attractions of the Everest Base Camp trek. Trekking to the foot of the world’s highest peak is not easy but with some willpower and an ability to walk 6-7 hours a day plus a couple of rest days in between, it’s entirely possible. The reward for all the hardship will be majestic mountain views and pristine nature. The trek will take you through stunning landscapes, ethnic settlements, old Buddhist monasteries at Monjo, Namche, Tengboche and Pangboche, and ultimately to the midst of towering peaks including but not limited to Mt. Ama Dablam, Mt. Kang Tega, Mt. Nuptse, Mt. Thamserku, Mt. Kusum Kangaru, Mt. Pumori, Mt. Lhotse, Lobuche Peak, Island Peak, Mt. Makalu and of course the breathtaking Mt. Everest itself towering to an altitude of 8,850 meters. We look forward to take you on a trek of a lifetime. Please see the itinerary for a day-by-day route. Welcome to the city of temples and the country of Himalayas. We will happily welcome you at the only international airport of Nepal; Tribhuvan International Airport. Our airport representative will be waiting for your arrival with a placard written Nepal Guide Info team. outside the airport terminal. From there you will be transferred to the Hotel by a air conditioned private vehicle. Depending on the flight time and activities we will be joining for a cultural dinner at a typical Nepali restaurant. Enjoy cultural shows, singing, dancing and typical Nepali meals before heading back to hotel. Enjoy breathtaking views of Himalayas on the your flight to Lukla. It’s one of the most adventurous flight rated by top rated websites and travel magazines. The flight takes approximately 30 minutes. Once we reach Lukla we will transfer to one of the lodges to enjoy first breakfast in the Himalayas. Here we will introduce you to the porter. Once we enjoy our breakfast we will start our walking to reach Monjo or Jorsalle. Our trek will pass through different villages like Chaurikharka, Chheplung, Ghat, Phakding, Toktok and Banker before we reach Monjo. We will enjoy our lunch in Phakding (2,610M) which is also the overnight stop for many trekkers passing this way. The trail from Lukla goes down gently and takes us through pleasant views. Once we reach Phakding and eat our lunch we will start moving to our final destination. The trail is flat until we cross Dudh Koshi River and then will start gentle climbing. It will take about 2.5 hours from Phakding to reach Monjo or Jorsalle. In total we will be trekking about four to five hours in total. Enjoy your breakfast in the Himalayas and get prepared to start one of the most memorable adventure of your life. If we stayed in Monjo then we will pass through national park check post and if we stayed in Jorsalle we will pass through Army passport check post. The trail goes little flat and then we will cross Dudhkoshi River once more then will start walking through another side of river. It is a pleasant walk with beautiful green hill views. We will again cross Dudh Koshi river before we start steep climbing uphill. Until we reach Top Danda the trail is pretty steep! Once we reach Top Danda we will have some far distance views of Himalayan peaks including Everest along with Nuptse and Lhotse on a clear day. After taking rest for a we will again start climbing to reach Namche Bazaar. From here the trail is easier and less steep comparing to the one before. Namche is considered as the gateway of Khumbu / Everest region. It is pretty big town with numerous activities available. Pool House, Nescafe Cofee, Bakery, Modern Lodges, Internet, Telephone, Laundry, Bank, Money Changer, Equipment shop etc., it got everything. Enjoy your time in this small modern town. You can sleep as much you want. If interested then you can go to visit Khumjung (3,780M) and Khunde (3,840M) villages, They are considered as twin villages in Khumbu region. There are few other options available if you want something else. You can also go to Thame (3,840M) to visit this beautiful village or you can go to Everest View Hotel (3,700M) to see some views of Everest including some other peaks. Alternatively, you can just walk up to the army camp area (3,500M) and enjoy the beautiful Himalayas in front of you. You can spend rest of your time easily exploring around the Namche Bazaar. Explore the shops, try some bakery items or go for a Nescafe coffee. Enjoy this beautiful town, take some rest and prepare for next day! Enjoy your breakfast in the Himalayas before we start trekking to Tengboche; another magnificent village of this region. The trek starts with short climbing before we reach the army camp. Then the trek is flat until we reach Kenjoma. You can give some rest to your legs in front of magnificent and huge Amadablam mountain. From here the trail to Gokyo Lake and the trail to Everest Base Camp separates. The trail on the left hand side takes you to Gokyo Lake where the trail on the right hand side takes you to Everest Base Camp, so we follow the right trail. From here the trail steeps down until we reach Phunki Tenga for our lunch. This place has very few lodges with basic services available. Once we finish our breakfast we again cross Dudhkoshi River before ascending to reach Tengboche. The trail again goes steep up through beautiful forests with numerous views of villages in the horizon. As the trail ascends up we will also reach Tengboche in about an hour where we will be stopping for overnight. Tengboche offers close views of Amadablam which is considered as one of the beautiful peaks in the world. If you are keen about photography then this will be a good stop for taking some pictures in the horizon. Tengboche also got one of the biggest Buddhist monasteries in this region where you can also attend daily praying of Buddhist monks. We will descend to Dibuche and the trail takes us through gentle uphill until we cross Imja Khola. From here the climbing becomes little steeper until we reach another village called Pangboche (3,930M). Pangboche is home of many Everest climbers. The views of Amadablam mountain from this village becomes immense. The views of other Himalayan peaks will look prettier as well from this point. If interested you can take a tea or a coffee in front of those beautiful Himalayan peaks else continue to our lunch spot called Somare. Somare is tiny town with basic lodges and numerous tea houses available for lunch. Most travelers / trekkers heading to Dingboche or Pheriche stops here for their lunch. Even after Somare the trail is pretty easy and mostly gentle uphill. After walking for awhile, we will reach Orsho and from here the trail to Pheriche and Dingboche will separate. Continuing further for less than an hour we will reach Dingboche Valley. It’s gorgeous valley surrounded by majestic peaks. Dingboche is also the gate for Island Peak Climbing. Island Peak is one of the most popular trekking peaks of Nepal which is climbed by numerous climbers every year. Here we come for another acclimatization day in Dingboche. Enjoy your sleep until you want. Once you wake up you will be served with your breakfast in the lodge. If interested, we can climb to top of the hill for acclimatization purposes. Climbing high and sleeping low is considered as good way to acclimatize with your body. This is steep climbing to this hill and you will also see many people climbing uphill or returning downhill. From the top of the hill, you will also see beautiful views of many Himalayan ranges including Makalu. Alternatively, you can also go to Chukung (4,730M). Chhukung is the last village for people heading to Island Peak Climbing. We will start the trail through gentle uphill climbing on the top of Pheriche Village. Here the trail is mostly clear, remains no trees and the towering Himalayas will be always beside us. Continuing the walk for nearly 2 hours we will be crossing small stream before we reach Dughla. There are only couple of lodges or guest houses available for meals. If hungry we can stop here for lunch else we will take some hot drinks before starting steep climbing to Dughla Pass. From here the condition of the trail is not satisfactory. The trail consists of numerous huge rocks and yaks will be passing nearby. In one hand the trail is steep and in another hand we will be walking in high altitude. Getting tiredness is normal for almost everyone. Ascending further, we will reach a place with many memorials made in the memory of climbers who passed away in this region. We ascend a little more from here we will reach the trail coming from Gokyo Lakes and Cho La Pass. The trail will become slightly easier from here and mostly we will be walking on the flat. Here we come at Lobuche. Lobuche has few houses and all of them are only for commercial purposes i.e. guest houses, lodges, small tea shops etc. We will enjoy hot breakfast in Lobuche before we start hiking to Gorakshep; one of the major places of our adventure. The majestic mountains will be following us all the way till we reach the destination. Peaks become closer and fantastic. The trek is do not have any steep climbing though it will be difficult and tiring due to high elevation. We will be walking in between 4,900 meters to 5,300 meters on this day. The trail is quite wide and easy to walk. It is short hike to reach Gorakshep. Once we reach Gorakshep we will keep our belongings in the lodge before we have our lunch. Once we get our lunch we will start our hiking to Everest Base Camp before it’s too late. The hike is about 5/6 hours in total. It is one of the longest, hardest and important days in our adventure. The route from Gorakshep to Everest Base Camp includes numerous short ups and downs. The trail condition is not satisfactory everywhere and includes many small rocks along the route. Be careful while walking so the rocks won’t slip you and make fall down. 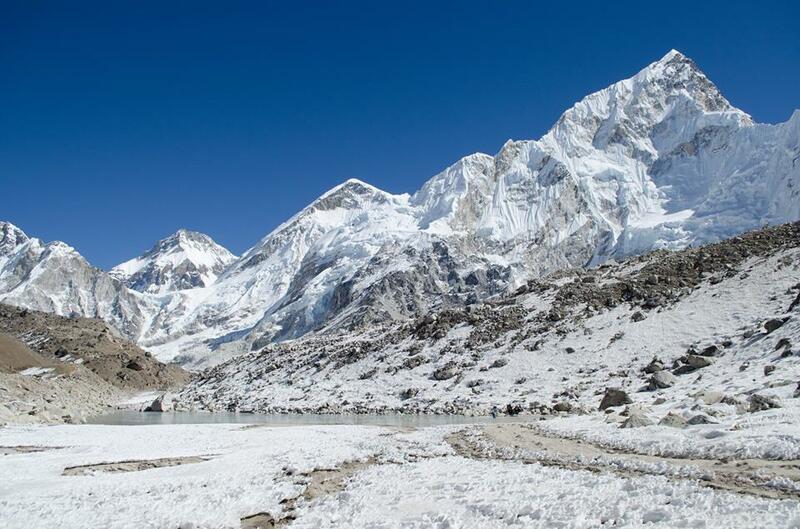 Enjoy breath-taking views of Everest, Pumori, Nuptse, Lhotse along with several other peaks. On a lucky day, you will also be able to enjoy some of the avalanches on the another side of Khumbu glacier; one of the biggest glaciers in the world. Once we reach Everest Base Camp we will enjoy taking some pictures. Give some time to enjoy and play with nature because you won’t find Everest Base Camp anywhere else in the world. After finishing our activities around the base camp we will return back to Gorakshep through same trail and prepare for another day. It is early morning cold walking in the dark but trust us it’s enjoyable and it will be one of the memorable time of your life. Don’t get slipped in the icy trail. Depending on the sunrise time your guide will give you time to start hiking to reach this beautiful hill top. Wake up on time and prepare cloths that won’t let you be cold. The hike from Gorakshep to Kalapatthar is about an hour steep climbing. Depending on your walking speed it may take a little more or less. Kalapatthar is the same place where world’s highest cabinet meeting was held by Nepal Government to aware world global warming and about the speedily melting Himalayas. Kalapatthar gives authentic and magnificent views of Himalayas just in front of you. It’s wonderful view point that only few people have seen it. Congratulations to witness this heavenly place with Nepal Guide Info Team. Take some shots of you and peaks, enjoy your photography in this place before we will again return back to our lodge to start walking down to Pangboche. Once we return back to our lodge in Gorakshep we will have our breakfast and get ready to descend down. The trail is about the same that we used to ascend up. The only difference is that in stead of going to Dingboche we will descend down to Pheriche and reach Pangboche directly. It will make the trek little shorter and we will also have chance to visit another visit. Pangboche is the place where many mountaineers were born. Pangboche is also the last village for climbers heading to Mt. Amadablam. We are descending down to conclude our adventure soon. We will have our breakfast in the hotel before we start walking down. This is the same route that we used to go up on previous days. We will be walking through beautiful villages along the way like Debuche, Tengboche, Phunki Tenga, Kyanjuma etc. before we reach Namche Bazaar. The views of Himalayas will be still there along with us. The trek is about 5/6 hours in total. Enjoy your time in Namche before we start our short trekking to Phakding village and then to Lukla. From Namche it’s mostly downhill until we reach Phakding. From Phakding it’s all the way gentle uphill till we reach Lukla. We will be walking through beautiful green forests having views of villages in the cliffs. Animals are rare though some lucky trekkers will also see Himalayan Thar near the forest. Crossing numerous stunning suspension bridges we will reach Phakding. We will have our lunch in Phakding and continue our journey to Lukla. We are coming to conclude our memorable trekking. This is the last day and our final night in the Himalayas. Like the previous day there is no rush to reach Lukla. We can sleep till late morning and start the trek before noon. The trail from Phakding to Lukla is mostly gentle uphill. On the way we can enjoy stunning in the horizon. We will also have sights of flights coming to Lukla and flights taking off from Lukla. They look awesome when we are close to Lukla. Once we reach Lukla we can enjoy some beers or cocktails. Lukla is one of the major towns in this area. It’s your last day with your Sherpa helper so it’s time to give them some gratitude [tips] if you are happy with the services. It will be expected from your staffs and we also recommend you to tip them according to your satisfaction and ability. We take the earliest possible flight back to Kathmandu. Enjoy another breath taking flight to Kathmandu. The flight is about 30 minutes and will give you some thrilling experience for sure. You can relax and stay in hotel or explore around the town for some shopping to your friends and family members. Once your guide will drop you in hotel he may left you. You can also give him some gratitude if you are happy with his services. Some trekkers / our customers also invite guides for a dinner together in Kathmandu. This can be the last day that you will meet your guide. Enjoy your last days around the valley. If you are willing about other activities like Jungle Safari or Rafting or Paragliding then we will assist you accordingly. Lukla gets occasional flight delays during the main season. This may cause missing your international flights as well so we recommend you to prepare accordingly. Lukla suffers from quick weather changes and that may affect inbound and outbound flights. We reserved this day for possible flight delays. In case we have timely flight on DAY 14, we can use this day as rest and exploring day in Kathmandu. We can shop around local markets and walk around the city.